Check out this great bargain that has all of BFF's resources in one easy place! Purpose: This video The Flow, developed from 1 John 2:12-14, shows how Christians grow, how to detect where they are in their spiritual growth and what they need for further spiritual growth. The power of this presentation is in the overall view of the whole Christian life, and its use of a familiar analogy to help us apply it to our spiritual lives. We can actually initialize spiritual growth in individuals and churches! This is the biblical theology needed for Christian living. Please click below to start the video and see how John uses the family analogy to help us understand spiritual growth. There are also some helpful discussion questions below. These study questions seem simple but can get quite involved. Depending on your time and audience, pick out ahead of time the set of questions that best relates to your needs. Don't be afraid of spending two sessions discussing spiritual growth. So many foundational teachings are incorporated in this discussion. List the items that the elderly apostle says to each of the three groups? Be specific. What characterizes each of these three stages of the Christian's growth? What are the problems or challenges that those in each spiritual stage will face? Summarize what is supposed to happen in each of these stages of spiritual growth? What might happen if Christians in these various spiritual stages do not get the needed support? Be specific. Which stage of spiritual life are you in? Is that where you should be? From the above discussion state the main problems that you face in your spiritual life. How are you dealing with your particular challenges? How have you found God's Word to help you battle such challenges? Give an example. List one practical way that you can further meditate on one truth that is relevant to your spiritual growth (passage to study, memorize, etc). What should you do if you find that you don't fit into any of these groups? What is your responsibility to others that are in your own group? To those in other groups? What responsibility does the church have to further the growth of God's people? See Matthew 28:19 and Ephesians 4:11-13. Write out what specific training the church provides for those in each spiritual level. How can the church help new Christians grow? What further steps can be taken? From 1 John 2:12-14 what special instruction must be deeply ingrained in new believers and taught in basic discipleship materials? How should the church help those 'young Christians' who are battling temptations? How can the church better foster believers to carry out their 'big brother' responsibilities? What should we do with those Christians who are not growing? What specific steps can we give to a Christian take who sees his or her friend not growing? How does a Christian's growth through these stages prepare them for leadership? What specific training do developing leaders need in the 'father' stage? 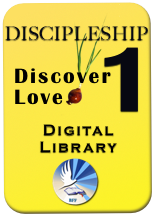 The handouts for this discipleship seminar and many other materials can be found on the inexpensively priced BFF Discipleship Training Library.